Our Tenants’ Handbook is packed with essential information. You’ll find everything from details of your Tenancy Agreement and how to report an emergency – to guidelines on pets, lodgers and running a business from home. To read the most recent Tenants’ Handbook online, or to download for printing, click on this link. 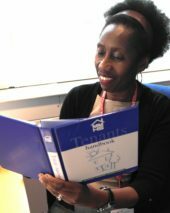 Everyone at the Society has to refer to this publication at some stage – such as our Financial Services Director Atawa Aryee!